A neighbor or someone you know has a tailless cat. You've never seen anything like this so you inquire, they tell you it's a Manx cat. They got it from a shelter or SPCA. The breed is very unique, it has no tail, hind legs longer than it's front, sort of hops when it runs, is very affectionate and has a high intelligence level. The breed interests you so you set out to find out more about it, perhaps get one of your own. 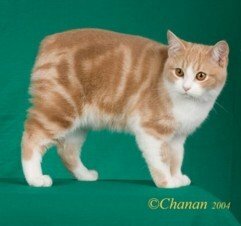 It's not long before you realize how unique the breed really is, there aren't many Manx cats or breeders to be found, easily. You decide to search the internet, there you find web sites, breeders and loads of information. You make contact with a registered Manx breeder who informs you the tailless cat you thought was a Manx cat might not be an actual Manx cat. This puzzles you, so you inquire further. You learn that not every tailless cat is a Manx. In fact, the genetic mutation which causes the actual Manx breed cat to be born without a tail can happen in "any cat" spontaneously. This happening in "any cat" does not then automatically make that cat or it's offspring born without tails Manx breed cats. Shelters, SPCA's, back yard breeders and even Veterinarian's are the largest source of spreading the myth about all tailless cats being Manx. Manx cats are "best known" for being tailless cats however, there are fully tailed kittens born in just about every registered litter. The true Manx cat has traceable descendants from the Isle of Man, a small island located off the coast of England. Several hundred years ago a spontaneous mutated gene carried a dominant trait which occurred at some point on the island. This mutation created some kittens to be born without the vertebrae that form the tail of normal cats. With the passage of centuries and due to the isolation of the cats from outside breeding, the taillessness eventually became a common characteristic among the Isle of Man cats. So, just as people who may "look" to be a specific nationality, yet can't actually claim that nationality without having actual ancestry, it's the same with the Manx breed cat. Registered Manx breeders refer to tailless cats with unknown origin as Domestic Tailless cats. Their origin is not usually known and it cannot be proven they have Isle of Man descendants. There are several cat breeds with shortened tails, one can't assume a cat is a Manx due to it's shortened tail or lack of tail. Domestic Tailless cats are not bred selectively like registered Manx cats. The genetic mutation which causes the Manx breed to be born tailless has limitations, there can be health complications in some cats who carry it and are not monitored how they are bred. Tailed Manx are very important in a breeding program, they give it stability and soundness. I've had many instances where people contact me about Domestic Tailless cats with heart wrenching stories, the out comes is usually the same, it always ends in heart break just because they through they were doing something good or saving a few bucks. If you want a Manx cat bottom line is your best choice is to purchase one from a reputable, registered Manx breeder. Choose a breeder who is actively showing their cats, they will be most informed on the breeds standard and be looking to produce kittens that model it to show them. Seek breeders who are willing to supply other breeders actively showing their Manx as references. (Who best to tell you if the person is a good breeder than their peers!) Registered breeders take great pride in their breeding programs and offspring, they don't sell their Manx to pet stores, allow their cats to be used in back yard breeding programs or end up in shelters. They have a sales contract with a written health guarantee, require the cat be returned if things don't work out and are there long after the money has been spent and the sale is complete. These breeders place their cats spayed or neutered or have an altering clause in their contract and with hold the registration papers until proof has been supplied it has occurred. You can expect not to permitted to declaw these cats, this is very inhumane and painful. How would you like your fingers cut off at the first knuckle? Since there are many dangers most pet owners aren't aware of for cats outside you can expect your breeder to never allow their cats to be outside cats. Owning a Manx cat be one of the most enjoyable pleasures in life. They've been known to live up to the ripe age of 17.